One of the most popular attractions in Italy, not to mention one of the most famous archaeological sites in the world, is the excavated ancient Roman city of Pompeii, which was buried by a volcanic eruption from Mt. Vesuvius in the 1st century C.E. Pompeii is famous – and it should be. It’s a huge archaeological site, once a large and thriving Roman city full of people. Visitors head for Pompeii in droves, usually on day trips from nearby Naples, the Amalfi Coast, or even Rome. It’s something I highly recommend you see at least once in your life, preferably with a good guide who can give you a mental picture of what all those ruins used to look like. 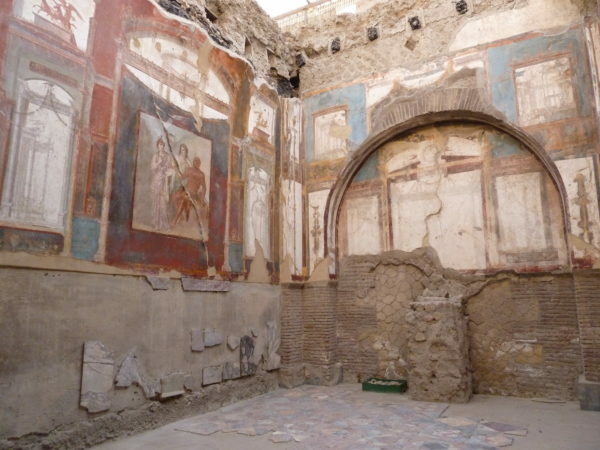 Unfortunately, though, too many visitors head for Pompeii and then leave the area, missing out on another excavation in the area that is – in my opinion – even better: Herculaneum. 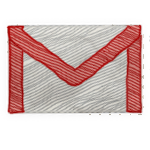 The 79 C.E. eruption of Mt. Vesuvius, like most volcanic eruptions, happened in a few stages. The first blast led to a large amount of ash falling on Pompeii, crushing buildings. It wasn’t until a later blast that the pyroclastic surge thundered down the mountain and buried the nearby city of Herculaneum. Because of the different types of matter falling on the towns, Pompeii’s buildings were more heavily damaged at the time before eventually being buried, while Herculaneum was almost preserved as it stood. 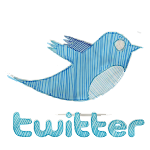 When the two cities were finally unearthed again, that was still the case. Pompeii’s ruins are impressive, but the buildings are largely rubble. 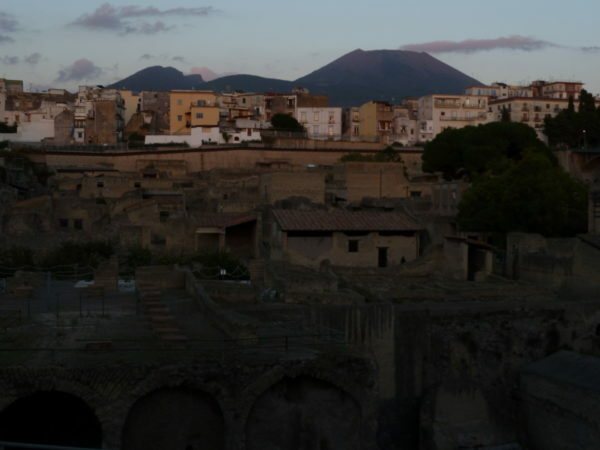 Herculaneum, by contrast, still has houses standing on either side of ancient streets. 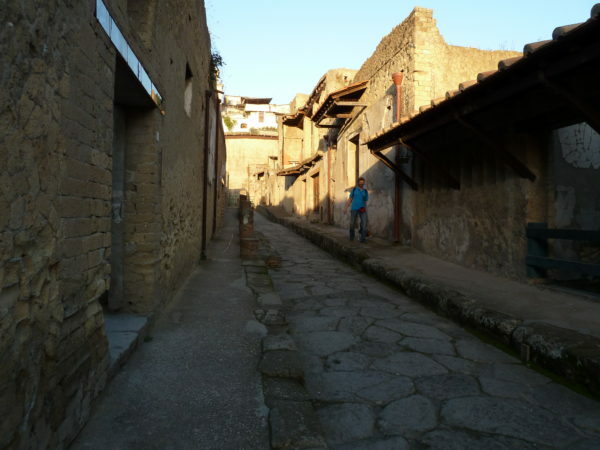 Walking through Herculaneum, you get a much better feeling of what the city was like 2,000 years ago – you can almost imagine that these are the streets of a town that are only quiet because the residents are indoors, not that they’ve been dead for two millennia. 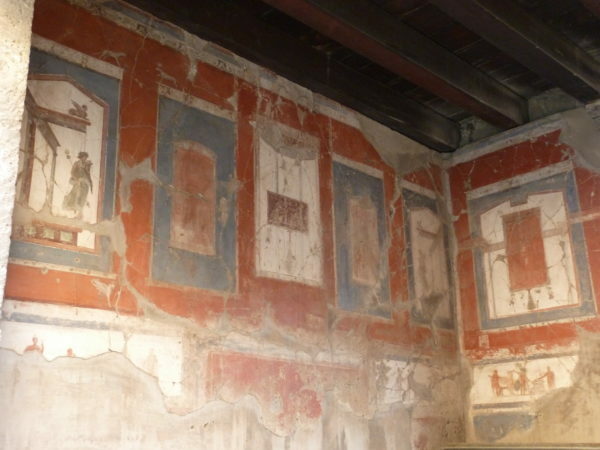 Not only were multi-storey buildings in Herculaneum preserved, organic materials such as wooden beams and even some items of food were still preserved when archaeologists dug into the site starting in 1738. The excavation site of Herculaneum is quite a bit smaller than that of Pompeii. 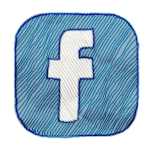 This is partly due to the fact that there is a modern city – called Ercolano – built over much of what was once the ancient city. There’s no way to fully excavate Herculaneum without evicting an entire population today, so what visitors can see is a small portion of what the city once was. It wasn’t as large as Pompeii, even in 79 C.E., as it was a beach resort town for the wealthy. Pompeii, on the other hand, was a busy city with many levels of society. Herculaneum’s size makes it easy to visit at a leisurely stroll without missing anything. At Pompeii, by contrast, you can spend a half day and still not see everything. There are important parts of Pompeii roped off to keep the fragile structures protected. 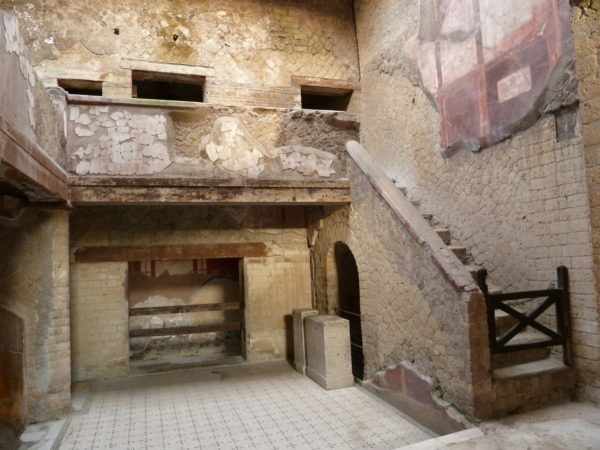 At Herculaneum, far fewer areas are behind ropes, giving visitors greater access. 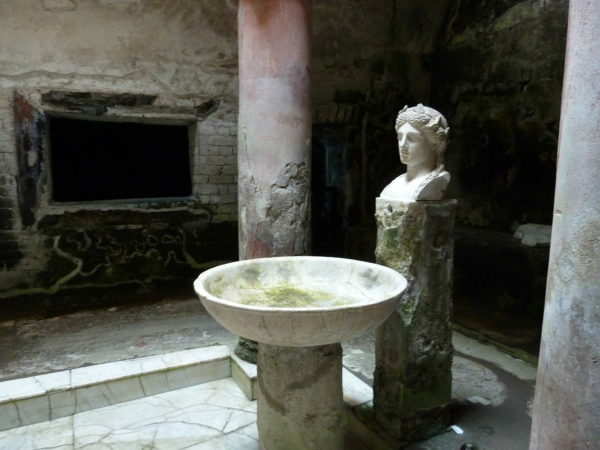 Herculaneum is also usually much less crowded than Pompeii, since many people don’t even know it’s there. Many of the exquisite frescoes, mosaics, and sculptures from both Pompeii and Herculaneum have long since been removed from the excavation sites and are now on display in the fantastic Archaeological Museum in Naples (which you should totally have on your itinerary in Naples already). 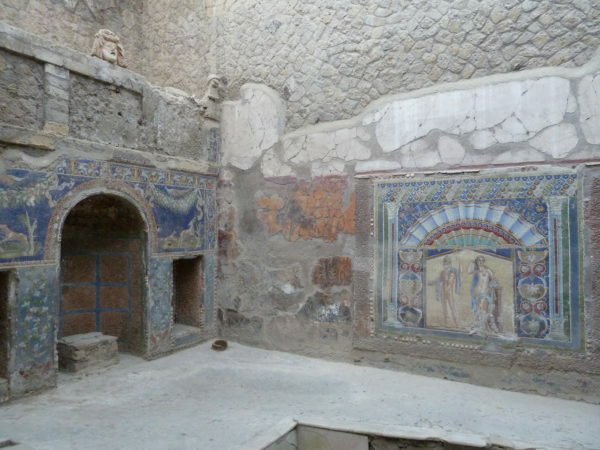 But where a visit to Pompeii can leave you feeling like you need some guidance about what you’re looking at, a visit to Herculaneum gives you a much clearer picture of an ancient Roman city. 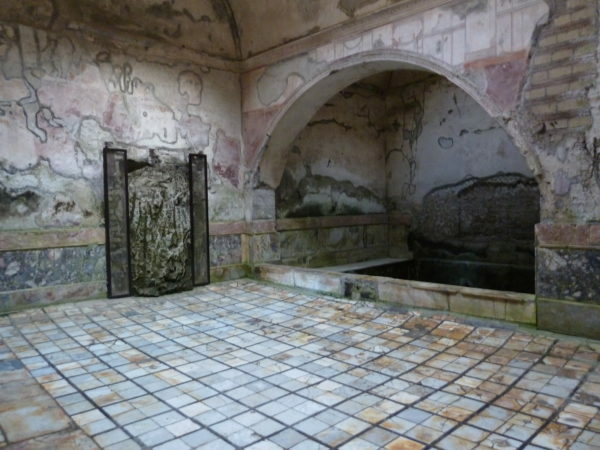 Luckily, you don’t need to choose between visiting Pompeii or Herculaneum. The two are located along the same Circumvesuviana train line that connects to Naples and Sorrento, and with a well-planned day or a guided tour you can visit both in one day trip from Naples, Sorrento, or the Amalfi Coast. Seeing both in one day is a wonderful way to learn more about an important historic event, and including a stop at the Archaeological Museum in Naples completes the picture. Shhhh, you’ll blow the secret and everyone will show up!